Focusing on improving the diagnosis, prognosis, and management of human disease, this book takes on the issues of research design, measurement, and evaluation which are critical to clinical epidemiology. 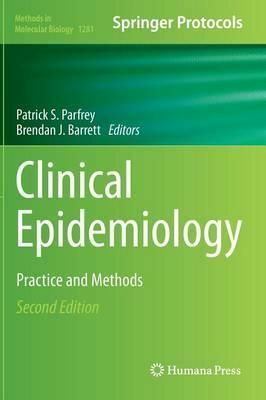 This second edition of Clinical Epidemiology: Practice and Methods opens with how best to frame a clinical research question, the ethics associated with doing a research project in humans, and the definition of various biases that occur in clinical research. From there, it continues by examining issues of design, measurement, and analysis associated with various research designs, including determination of risk in longitudinal studies, assessment of therapy in randomized controlled clinical trials, and evaluation of diagnostic tests, and then delves into the more specialized area of clinical genetic research, before concluding with basic methods used in evidence-based decision making including critical appraisal, aggregation of multiple studies using meta-analysis, health technology assessment, clinical practice guidelines, development of health policy, translational research, how to utilize administrative databases, and knowledge translation. Written for the highly successful Methods in Molecular Biology series, chapters include the kind of detail and practical advice to ensure real world success.Comprehensive and authoritative, Clinical Epidemiology: Practice and Methods, Second Edition is intended to educate researchers on how to undertake clinical research and should be helpful not only to medical practitioners but also to basic scientists who want to extend their work to humans, to allied health professionals interested in scientific evaluation, and to trainees in clinical epidemiology.